Mai Kujaku! Dinosaur Ryuzaki! Esper Roba! 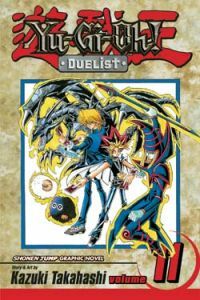 The world's greatest duelists are in town for the Battle City tournament...but a mysterious group is stalking the tournament to steal the most valuable cards! The Rare Hunters are more than thieves...they're pawns of the mysterious Marik, a deadly duelist from Egypt who already possesses two of the three most powerful cards in the world. And to defeat them, Yugi must find a way to beat Exodia, the world's most unbeatable combo! YU-GI-OH! © 1996 by Kazuki Takahashi/SHEUISHA Inc.